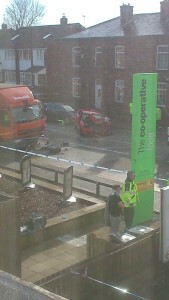 Residents who live near the Co-op on Parr Lane will be aware that there was a very bad road traffic accident right outside the store this morning, just before 8am. 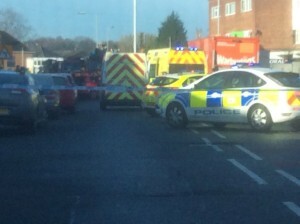 The Manchester Evening News reports that four people have been seriously injured, with one of the injured taken to hospital by the Air Ambulance which landed nearby. 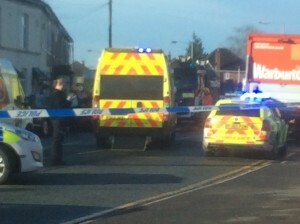 Photos from passers-by (thank you to Jacqui Lomas and Brian Clarke) show that a red car appears to have crashed into a Warburtons bread delivery lorry which was parked on the double-yellow lines (facing oncoming traffic). In certain circumstances, delivery vehicles are allowed to park on double-yellow lines for loading and unloading only, however the highway code states that should only occur as long at is is not left unattended. It is also in contravention of the Highway Code to park against the traffic flow (i.e. facing the wrong way). Delivery drivers to the Co-op rarely use the loading bay around the back – I certainly found it quite common that a lorry is parked outside, which makes moving out of the junction of Chadderton Drive (my road) very difficult. It will also be known to locals that Co-op customers often park on the double-yellow lines, so I suppose it was inevitable that an accident such as this was going to occur sooner rather than later. It is a miracle (and testament to modern car manufacture) that no-one was killed this morning. I will be writing to Co-op tomorrow to ask them to send instructions to ensure all their delivery drivers to use the loading bay around the back of the store and to try and do more to actively discourage their customers from parking on the double-yellow lines outside their store. Long term, it may be worth exploring other ideas to discourage parking there. I have some ideas, but lets see what response I get from Co-op first.